“Lady Macbeth” (2017). Cast: Florence Pugh, Cosmo Jarvis. Paul Hilton, Naomi Ackie, Christopher Fairbank, Golda Rosheuvel, Anton Palmer, Cliff Burnett, Bill Fellows. Director: William Oldroyd. Screenplay: Alice Birch. Novella: Nikolai Leskov, Lady Macbeth of Mtsensk District. Web site. Trailer. How far are you willing to be pushed before you reach your limits? Some of us might cave in quickly, while others will endure much. A lot ultimately depends on the nature of the circumstances and how willing we are to tolerate them. 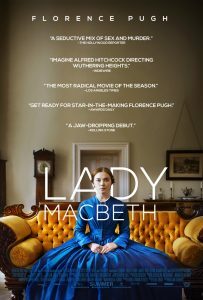 For one independently minded woman, those limits get reached rather fast, and her recourse is something to which most of us would probably never resort, consequences explored in the chilling gothic tale, “Lady Macbeth,” available on DVD, Blu-ray disc and video on demand. In 1865 rural England, the young, lovely Katherine Lester (Florence Pugh) is “sold” into an arranged marriage. Now betrothed to a cold, unfeeling husband, Alexander (Paul Hilton), thanks to a deal brokered by his father, Boris (Christopher Fairbank), Katherine becomes the lady of the house but primarily in name only. In Alexander’s view, Katherine is more like property or a showpiece than his loving spouse. He issues an array of dictates to keep her line, such as forbidding her to leave the house to go for walks. At the same time, he shows her little attention, be it emotionally, romantically or even sexually. And, to make sure that she keeps in line with his demands, Alexander allows his father and the local vicar (Cliff Burnett) to exert whatever pressure is needed to see that she conforms. Needless to say, Katherine tires of such treatment quickly. However, given the rigid social strictures of the day, especially when it comes to women “knowing their place,” what is she to do? The opportunity to assert her independence comes when Alexander is called away on business for an extended time. She begins engaging in forbidden activities, like going for walks by herself. But the biggest challenge to her husband’s authority comes when she takes a lover, Sebastian (Cosmo Jarvis), a stable hand who shows her the kind of attention that Alexander won’t. Before long, the two launch into a full-fledged affair, one in which Katherine’s not especially discreet about her behavior – and something about which she’s not overly concerned, even upon Alexander’s unexpected return. Having had a taste of personal empowerment, Katherine won’t settle for things going back to the way they were. She knows what it means to be in charge of her destiny, and she obviously likes it. But, to maintain such control, she must now resort to more drastic measures, some of which carry potentially serious consequences. In an age where women have been increasingly claiming their power, this film is quite a timely release. However, the picture also provides a powerful cautionary tale in asking the questions, “How much is too much?” and “How far is too far?” In fact, that provides a valuable hint about the meaning lurking behind the title of this release; while the story has nothing to do directly with Shakespeare, it has everything to do with the character after whom Katherine is patterned. This is crucial to how Katherine’s reality unfolds. The outcome is a direct result of the power of her beliefs, thoughts and intents, for they shape her existence through the conscious creation process, the means by which it arises and materializes around her. However, while those metaphysical building blocks may give her what she seeks, they may also hold the potential for related fallout that could end up carrying significant and troublesome consequences. When we create without regard for what may accompany our sought-after goals, we can set ourselves up for extreme difficulties, ranging from personal hardships to legal liabilities to even bad karma. This is known as un-conscious creation or creation by default, where the drive for the fulfillment of our objectives takes unqualified precedence over anything else. It may indeed bring us what we seek, but it might also saddle us with trials and tribulations no one would want. In large part, this practice arises from a notion known as pushing the Universe. As our divine collaborator in the conscious creation process, the Universe (or God, All That Is or whatever other term best suits you) acts as our manifesting partner, providing the means to bring about outcomes in line with our beliefs. However, when we infuse our intentions with a forceful attitude – one hell-bent on achieving the desired results, no matter what the cost – we may end up unwittingly pushing our collaborator into bringing us outcomes laden with all manner of unwanted baggage. Even if their appearance doesn’t show up immediately, their presence is likely to appear at some point, perhaps when we believe we’re in the clear or when we least expect it. Katherine obviously disregards these considerations in her approach. At first glance, she seems quite successful in getting what she wants. But will that last? Considering the power she’s wielding, the outcomes she seeks, and the potential consequences associated with her beliefs and actions, one can’t help but wonder how long her luck will last. There’s an important caution in that for any of us who believe we can get away with whatever we want, whenever we want, even if the hoped-for results manage to materialize. We need to tread carefully, lest we end up with more problems than we started with. With that said, “Lady Macbeth” is a film that’s definitely not for the squeamish. Even though it avoids the trap of gratuitousness, there are aspects of the story that could prove unsettling for more sensitive viewers. However, in delivering this powerful and sometimes chilling tale, director William Oldroyd and a fine ensemble cast led by Florence Pugh serve up a tale full of questionable and conflicted emotions and motivations, all wrapped up in a beautifully filmed period piece package. For its efforts, the picture received two BAFTA Award nominations and an Independent Spirit Award nomination for best international film. It’s been said that “Hell hath no fury like a woman scorned,” and those on the receiving end of such animosity can attest to the wisdom of that statement. However, knowing when to rein in that scorn is crucial, too, especially for those who want justice without going over the top. “Lady Macbeth” puts both issues in perspective and gives us pause to contemplate the options before there’s no going back.